"100" token, awarded by mpopov. 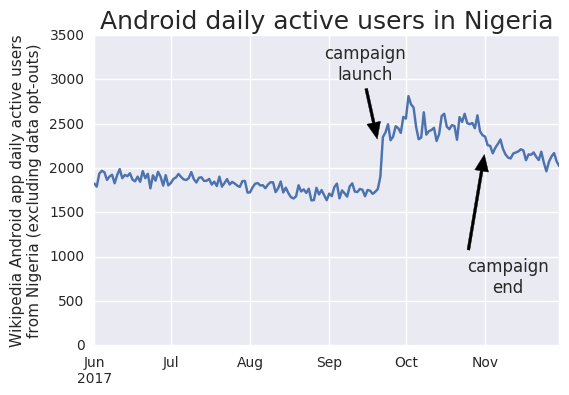 The rough takeaway from the chart below: Right after the launch of the campaign on September 20, the app's daily active user numbers in this country increased by about 800 (i.e. almost half of the existing baseline), and stayed roughly at that level until its end (around Nov 1), after which they dropped again somewhat, but so far retaining more than half of that gain. • Tbayer added subscribers: JKatzWMF, Charlotte. And I took this opportunity to create a general DAUby-country dataset (for all countries and also for opted-in iOS users), calculated in the same way as the global one. For now it can be found at tbayer.mobile_apps_uniques_by_country in Hive, and I intend to run updates manually every month or so. -- Limit enforced by hive strict mapreduce setting. -- 1000000000 == NO LIMIT !